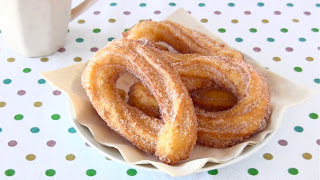 This video will show you how to make churros with chewy middles and crispy outsides! Este video le mostrará cómo hacer churros. 1. Cut parchment paper into six 5-inch squares. 2. Put A in a pan and bring to a boil. 3. Remove the pan from the heat and sift in the flour all at once. Then mix well with a wooden spatula or spoon until smooth. 4. Add beaten egg little by little and mix well. Then add vanilla extract to add flavor. 5. Transfer the batter to a pastry bag fitted with a large (0.6inch) star tip (do NOT use a round tip or the batter will explode!!!). Pipe rings onto the parchment papers. OR you can squeeze out the batter directly into the oil, cutting it with scissors. 6. Deep fry in oil at low (170C=338F) for about 4 minutes until golden brown (flip them 2 or 3 times). Remove the parchment papers when they start to come off. Place them on a wire rack to cool. 1. Combine the granulated sugar and cinnamon powder in a Ziploc bag. Add churros (while they are still warm) one by one and shake until thoroughly coated. Gracias por ver mi tutorial.